Author Written by Afshad Irani and last updated on Posted on July 13, 2017 . You require the subcontracting process in SAP when a company outsources parts of its manufacturing to subcontractors. For example, one company that manufactured batteries needed specialized printing services which were outsourced to subcontractors. Plastic boxes were provided to subcontractors and they did required printing on these boxes. Later, the subcontractors returned the boxes back to the client. The subcontractors charged the company for their services rendered per box. Another example of the subcontracting process in SAP is when a company provided raw sims and packaging materials to a subcontractor. The subcontractor converted the raw sims into finished sims well packed and returned finished product back to the company. They charged the company for their services rendered. 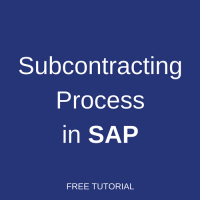 This tutorial will provide detailed guidance about working with subcontracting in SAP ERP system. You order the end product using a subcontract order. The components that the vendor needs to manufacture the end product are specified in the subcontract order. The components are posted to the stock of materials provided to the vendor. The components are then supplied to the vendor. The vendor performs its service and delivers the ordered material (the end product). The consumption of the components is posted. If, after the goods receipt has been posted, the vendor informs you that a larger or smaller quantity of the components was actually consumed than planned in the purchase order, you must make an adjustment. The vendor charges for his or her service. The invoice is posted. A material BOM needs to be created before any subcontracting order can be placed. The bill of materials (BOM) is a formally structured list of the components that make up a product. The list contains the object number of each component, together with the quantity and unit of measure. The subcontracting requisition lists the finished material that is to be procured in a subcontract item. Against each subcontracted item the system copies the material components that are to be provided to the vendor from the bill of material (BOM). The bill of material refers to the end product that the vendor will deliver. The requisition for subcontracting must contain the item category ‘L’ which is used for subcontracting in the SAP system. Subcontracting materials are sent to vendors for processing finished products. A subcontracting purchase order is placed by converting the subcontracting requisition into a purchase order. The system will generate a purchase order number internally. The rates quoted by the vendor for labour charges are mentioned in the purchase order line items. If a purchase info record has been maintained, the service charges are defaulted into the purchase order. To receive material against the purchase order, SIM cards and packaging materials need to be issued to the subcontractor. The materials that are provided to the subcontractor are managed as stock provided to a vendor. The provision is a transfer posting from the unrestricted use stock to the stock of material provided to a vendor. The SIM cards supplier will be instructed to deliver the raw material at the subcontractor’s premises. When the subcontractor receives the raw SIM cards at his premises, he will inform the client and a goods receipt will be posted with reference to the purchase order increasing the subcontractor stock in the system. If the material is already available in the client own stock, it will be issued from the unrestricted use stock to the vendor. The SIM cards will be issued with reference to the subcontract purchase order. When the vendor delivers the ordered packaged SIM cards (the end product), the goods will be received against the finished product with reference to the purchase order. Goods receipt items for the packaged SIM cards (end product) supplied by the vendor. Goods issue items for the SIM cards (components). The goods receipt will be valuated at the subcontract price plus the value of the SIM cards consumed. Invoices will be entered in the system against the purchase order. The vendor will be billed only for items delivered. At the time of invoice receipt a liability is created against the vendor. The liability created will only be of the amount charged by the vendor for processing and does not include the material component value. 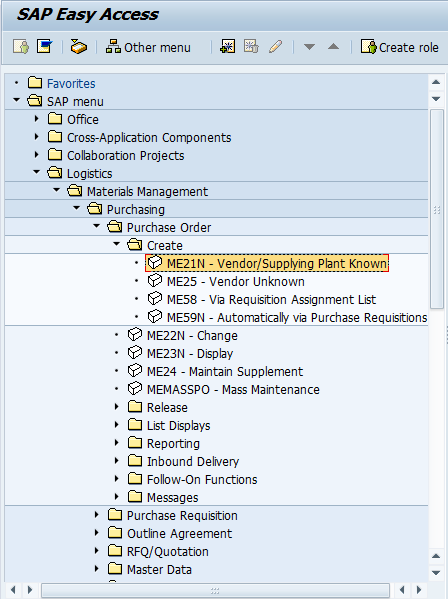 To create a subcontracting purchase order, start the transaction ME21N or navigate to the following path in SAP menu: Logistics→ Materials Management→ Purchasing→ Purchase Order→ Create (ME21N). In the Item Overview screen, you need to use Item Category ‘L’ which is used for subcontracting documents. Also, you need to provide Material, Quantity, Delivery Date, Plant, and Price. 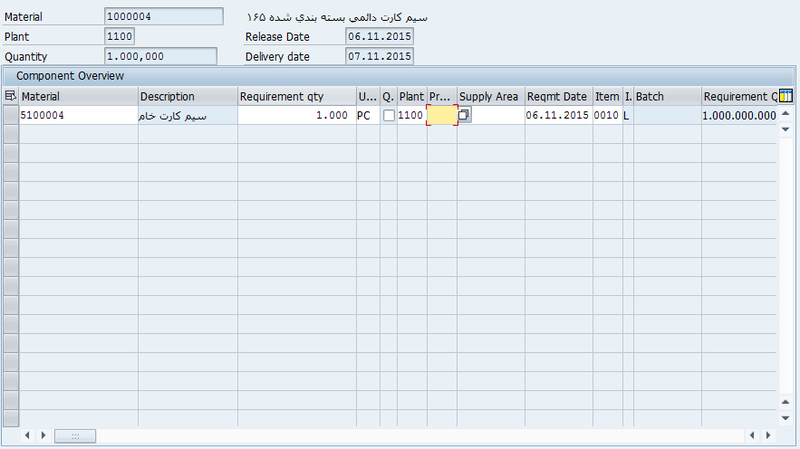 Now, click Explode BOM button to open the below screen, where you provide your components to the subcontractor. If there are any additional charges required, you input them in the Conditions tab as shown on the screenshot below. Finally, you save the subcontracting purchase order. Use transaction MIGO to provide components to the subcontractor. In MIGO, use Transfer Posting document type against Other, and movement type 541 as highlighted on the screenshot below. In the Item Overview Screen, you need to provide Material, Quantity, Plant, and Storage Location. If the material is managed with batches, a batch number will be shown as well. Now, click on Detail Data button. It will open the screenshot shown below. Here in the highlighted box you provide the number of your subcontractor. Next, click on Check button to check whether the document is OK. Finally, click on Post button to post the document. Now, when the subcontractor returned the materials after performing the work you need to enter the received finished material back into the SAP system by using the transaction MIGO. 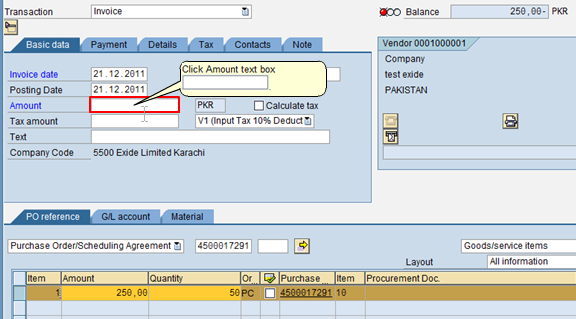 In MIGO, you need to choose Goods Receipt against Purchase Order with movement type 101 as shown below. Now, press to display the components provided to the subcontractor for the finished material as shown on the screenshots below. Next, click OK checkboxes as shown below. The first line corresponds to the goods receipt of the final product, whereas the second two lines correspond to the issue of components which you provided to the subcontractor earlier. The good receipt and the goods issue will be done simultaneously by the SAP system. Finally, it is necessary to click Post button to save the document. Now, let’s display the document that we have just created. It can also be done through via MIGO transaction. Start it and select Display against Material Document while inputting the document number as shown below and click Enter. Please note the movement types used: 101 for Goods Receipt and 543 for Issue of Components. 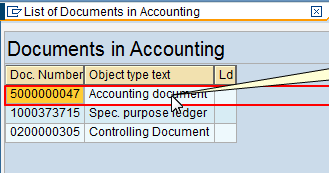 It is also possible to see accounting documents that were automatically generated by the SAP system during posting of material movements. To do it, click on Doc. Info button. 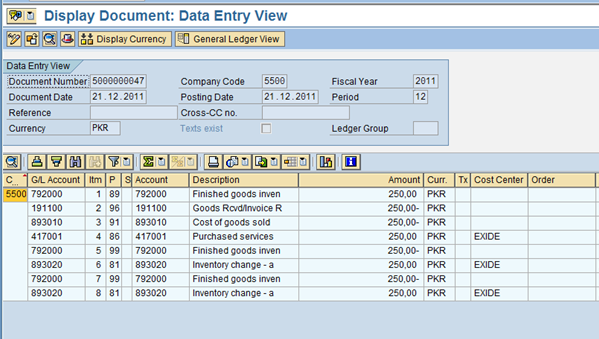 Next, click on FI Documents button to display FI document created for goods receipt and goods issue. The system will open a window with the list of documents in accounting. Double click on Accounting Document. Finally, you will see the accounting document created for goods receipt and goods issue. 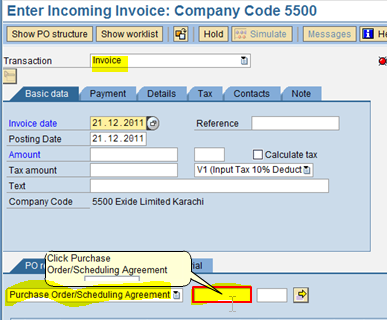 The next step of subcontracting process in SAP is to do posting of invoice receipt against the purchase order using the transaction MIRO. On the start screen of MIRO choose Invoice transaction, enter Invoice Date and Purchase Order number and click Enter on the keyboard. Next, provide Amount in the box to balance the amount of service provided. Click on Simulate button which will notify you of any errors. If none, a green light will turn on near Balance field and the SAP system will show you accounting document which will be created. Finally, click on Post button to save the invoice receipt (IR). Can we have subcontracting order without BOM/Components. You can have it without BOM by entering all the components manually. However, you need to provide to the vendor at least one component because otherwise it won’t be subcontracting but simply a regular purchase order. Is the Info record mandatory in subcontracting ? Thanks a lot. Easily understood and completed my Sub-contracting entry. Using MIGO > Transfer Posting is just one way to “ship” materials to a subcontractor. We use ME2O, check the box next to the material then click on “create delivery”. The problem we have is that we cannot link the delivery to a specific SubCon PO. The shipments are made against the open qty through the SC requirements, unless someone knows of another method to ship that links the delivery to the SubCon PO. Thanks a lot. You are a star!! Very easy to understand now. Please keep posting the knowledge. Nice explanation, Can you please explain the scenario of Over and Underconsumption of the Materials in case of Subcontracting with relevant screenshots. Once again thanks a lot for all your efforts.